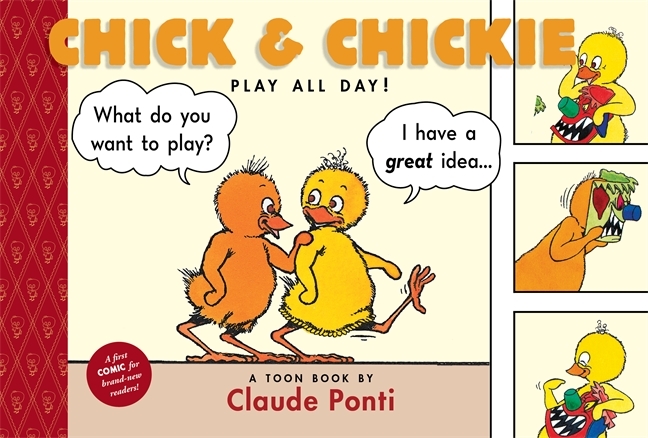 “What do you want to play?” Chick asks his friend Chickie, as they start this giggle-inducing comic book for beginning readers. With simple dialog and clear design features, this Level 1 Toon book will engage new readers with its humor and surprises. Chick and Chickie startle each other with silly, frightening masks. Then they play school with a giant letter A, tickling it, throwing it, and bringing it cake. New readers will enjoy reading this again and again, noticing details layered within the illustrations. The short sentences, easy sight words, large font size and use of dialog bubbles makes it successful for brand new readers. A winner in this outstanding imprint of graphics for new readers. This entry was posted in Review of the Week and tagged Claude Ponti, Mary Ann Scheuer, outstanding. Bookmark the permalink.